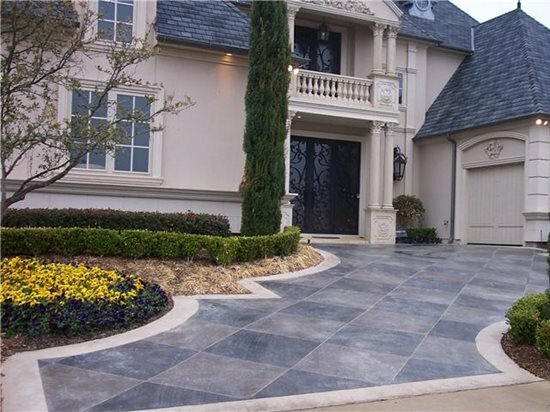 Few driveway paving materials can match concrete when it comes to sustainability and conserving the environment. Below are some of the top reasons why. The Portland Cement Association offers additional guidelines for maximizing the green attributes of concrete pavements at ConcreteThinker.com, a resource for sustainable design with concrete. They are made with renewable resources. Unlike asphalt pavements that are made with nonrenewable petroleum supplies, concrete pavements are made from abundant, sustainable resources including water, natural rock and sand, and cement. The predominant raw material for the cement in concrete is limestone, the most abundant mineral on earth. They can utilize recycled and waste materials. Your ready-mix supplier can also make the concrete for your driveway using waste byproducts, which reduces the consumption of raw materials and keeps waste out of landfills. Fly ash, ground blast furnace slag and silica fume—all byproducts from power plants, steel mills and other industrial processes—are commonly used as partial cement replacements. You can also use recycled aggregates in the concrete mix and reinforcing steel that has a high recycled content. They save energy by reflecting light. Concrete is naturally brighter and more reflective than asphalt, saving energy by reducing the need for lighting at night. Up to 27% of light falling on a concrete surface will be reflected, compared with as little as 5% of light from asphalt pavements, according to the American Concrete Pavement Association. In addition, light-colored paving materials help reduce the heat-island effect in urban areas. A properly installed concrete driveway should last for many decades—and at least two or three times longer than an asphalt driveway. Because concrete driveways don't need to be replaced or resurfaced as often, fewer raw materials are consumed over the life of the pavement. They can be recycled at the end of their service life.